Bike messengers have a hard-earned image as punks, rebels, thrill-seekers, and outlaws. And deservedly so. They risk their own safety to bomb through cities between cars and pedestrians delivering packages for very low pay. It’s an image and lifestyle that captivated the mainstream cycling world for the better part of the previous decade, spurring on massive sales of fixed gear bikes and messenger bags large enough to hold a body. For some enterprising couriers, the popularity presented an opportunity to align with sponsors and escape the check-to-check lifestyle of full time delivery work. Austin Horse partnered with big companies such as Red Bull and Oakley and bike companies such as Brooklyn Machine Works, All City, and Lazer and carved out a “wild and unpredictable” life for himself. 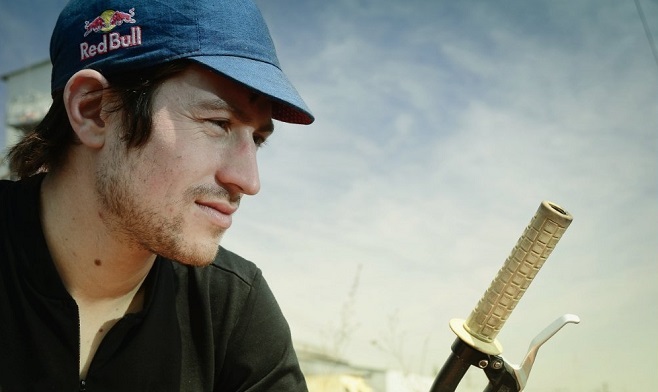 He travels the world riding and racing in unique bike events, organizes his own races, and even worked as Joseph Gordon-Levitt’s stunt double for the 2012 messenger movie Premium Rush. When he’s at home, Horse still works part time as a courier and as an advocate with his mobile bike co-op Bike Yard. 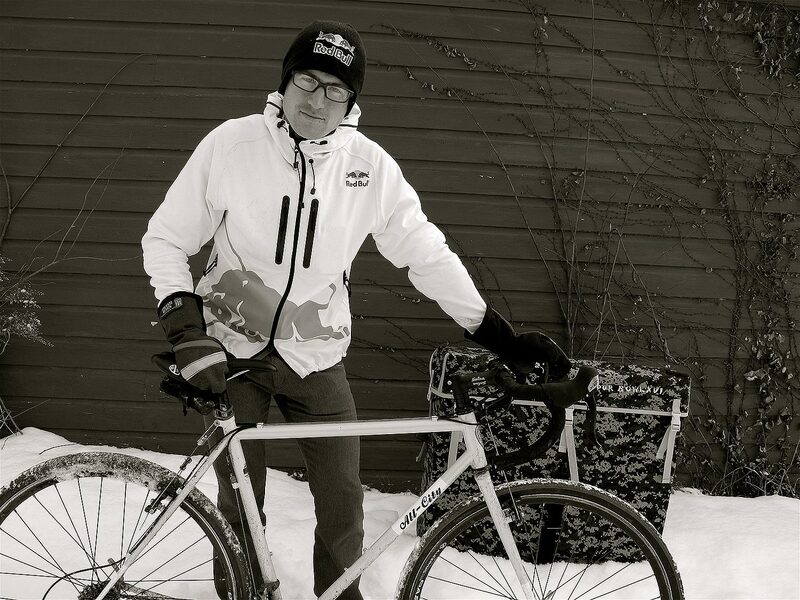 I spoke to him while he waited in the airport for a flight to the Middle East about messenger life in New York, sanctioned vs unsanctioned racing, his bike adventures around the world, the evolution of biking in New York, and much more. Where are you headed right now? Right now I’m headed to Amman, Jordan and Beirut, Lebanon. About half a year ago at the [Cycle Messenger] World Championships in Mexico, Leah [Hollinsworth] asked if people could chip in to help a couple folks from Beirut. They’d just started a courier company there and were hoping to go to the European Championships. I just volunteered my miles to fly them and we ended up talking though the Internet a bunch after that. That became one of the motivators for this trip. And if I could do it with people I already kind of knew it would be even better. Originally the idea was to just go and make a video in Beirut. I convinced my friend Nico from Chicago to come with me. He’s actually going to meet me in Beirut next week. But in the middle of all this, I was poking around on Facebook and found a race in Jordan this Friday. It’s a 200km race from the Dead Sea to the Red Sea. Another thing that’s been motivating me for a while is the idea of a low-tech bike share, more like a bike library. As soon as I knew I was going to Jordan, I contacted friends at Workman, the bike company here in Queens. I worked it out with them to bring five of their really heavy duty, practical bikes with baskets and fenders and stuff over with me. I’m still working it out with the embassy where exactly they’ll go. It’s going to be good. I’m also bringing two 20″ kids bikes. And I just checked them all on the plane. This is probably my coolest trip of the year. When I was a teenager. You know, what else are you gonna do? How did it grow from there? How’d you end up in New York working as a messenger? I moved to the New York area in 2005 to be closer to my grandparents. Being a messenger just made sense. It was something I wanted to do. It was a way to have fun on the bike, make money, and just sort of be free. Tell me about getting into racing. I’m assuming you followed the standard messenger to racer path starting with alley cats? Actually not. I raced a bunch of mountain bikes in high school. I did a bunch of other things in my early 20s that weren’t competitive. They were more just cool. I went to Alaska a couple times. Stuff like that. Then actually I didn’t really know about messenger races until 2005 when New York hosted the World Championship. I started doing messenger races after that and it grew from there. Have you followed the path into more formal, organized professional racing at all? Not really. Sanctioned racing is almost a relic in a way. It’s a relic of the limits of our imagination when it comes to the kind of events we can hold on two wheels. I haven’t held any kind of race license in two years. I actually will renew this December, but originally I let my license expire kind of as a protest and kind of as a push towards other types of racing. I think gravel has a really good model where they just celebrate racing for the fun of it. Those Midwest events just have the postcard entry fee and everyone just does it and there’s no promoters trying to make their money on it. There’s no governing body trying to control their monopoly on the event. I think anyone who’s been involved in cycling in the last 15-20 years has seen that the governing body has dropped the ball. It’s a business. They’re in it for themselves. I guess that’s a harsh way to put it. People are also hard to organize. I commend all the promoters for putting on events, whatever venue they decided to do it in. Has that been part of your motivation for organizing the messenger stage race and some of those other non traditional events? Kind of. If you go back to early years of stage racing with the Tour, it was one of the most amazing times in cycling. They were still figuring out what the format was going to be and it was at its most adventurous. That’s really exciting. Definitely more so than in the last few years where it’s been all pretty much the same stuff. When the variables are consistently controlled it’s kind of boring. It’s probably why I was intrigued by alley cats. I like stuff that’s a little wilder and unpredictable. As far as my stage race, it’s a celebration of this traditional form of racing, but presented in a format that puts a lot of the onus and responsibility on the racers. I track time on the race because it’s a stage race and that’s important. But that burden is put on the racers. When they get to the finish they have to mark their time. It’s all on the honor of riders themselves. Next year’s open stage race is taking place from DC to Boston on Aug 1-7. Then we’re doing a women’s only version from Boston to Philly Aug 7-11. Cycling’s given you the opportunity to do some amazing things in some amazing places. Do any of your adventures stand out as the best? Sometimes it’s been the scenery. Sometimes it’s just been the people you’re with. I think one of my all time favorite rides ever was when we rode from Paris to Eindhoven in 2008. That was magically. We went through France and the hilly part of Belgium. We rode around old broken down cathedrals. It was just great. We were with a really good crew. We finished in Eindhoven for the European Championships. The community was very strong and warm and inviting and wonderful. It was bike community at its best. Probably one of the crazier things I’ve ever done was earlier this year. Lucas [Brunelle], Chas [Christiansen], Manuel [Velez], and I rode through the Darien Gap. The Darien Gap is a missing section of the Pan-American Highway through thick jungle between Panama and Colombia. Lucas made a video that’s on the Internet now. It’s pretty cool. Tell me about your advocacy work in New York. Are you still involved with Times Up? Actually no. I’ve taken a step back and I’m doing my own thing. I had a good nine year run there. I have two projects. The one project is the NGO refugee camp project that I’m traveling to Jordan for right now. Then, in the spring of this year, another former Times Upper and I launched a mobile bike repair project called Bike Yard. It takes a bike co-op model, but we took it to a completely mobile platform. We’ve got a Surly trailer for the chassis. We fabricated a giant box that houses everything when we’re in transit. Then when we arrive it opens up and becomes a work stand. We have a pump, we have a tool wall, all the things you’d find in a shop. It’s something we can take anywhere in the city. With the co-op we wanted to be in a really central, accessible location that was easy to reach. We were in Little Italy, Lower Eastside, Williamsburg. Those are all neighborhoods that are not doing bad, you know what I mean? Especially Williamsburg. It probably has the highest density of bike shops anywhere in the city. Having a place that people can work on their bikes for free is really valuable and it gets a lot of traffic because of its location. But it’s limited in who its reaching. The mobile trailer is something we can take to block parties all around the city. We can take it to the community centers and shelters and anywhere like that. Then also because it looks good, we’re able to operate it on a 50-50 model by having corporate events. Because of that we’re never hitting people up for donations as they’re fixing their bikes at a free event or anything like that. It was difficult with the bike co-op to figure out where you’re making your money from. Then the trailer allows us to not pay rent. Our overhead is just a $30 storage fee. 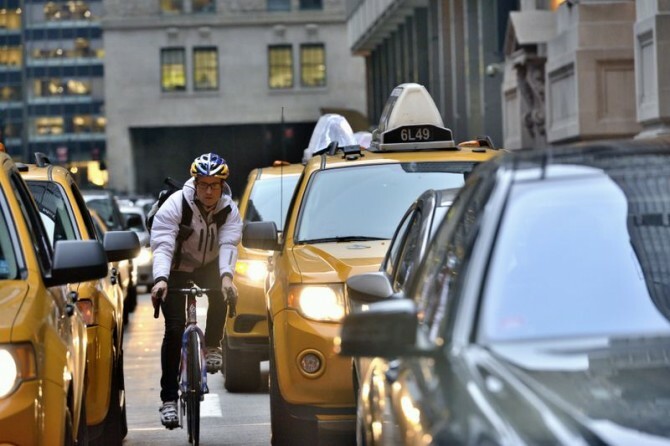 What do you think about New York’s bike boom over the last few years? Is it a better place to ride now than it was when you first moved to the city? It’s funny how it kind of comes and goes in waves. I moved to New York at the height of the conflict between Critical Mass and the police. That was something I paid a lot of attention to. For me, it was a very clear violation of our civil liberties. It was something I directly cared about. And even if maybe there were yahoos who got into Critical Mass and did some stupid things, at the same time, who are the cops to say I can’t meet with other people? When I think about my early years in New York, it was like a monthly battle that I would engage in. Things haven’t really changed. As long as all the laws are written for motor vehicles and enforced on cyclists as if they’re motor vehicles, it’s going to be unfair. It’s going to ruin people’s lives. I have a friend who’s received over $2,000 in red light tickets. It’s not reckless or anything like that. If you’re at a three-way red light on Flushing Avenue in the middle of winter and there’s no one around, why are they giving people tickets on that? That’s just bad policing. As far as the boom goes, the pressure came from the community to the mayor to do something about biking in the city. It was only about halfway through Bloomberg’s term that he actually started to do anything. Before Janette Sadik Khan was appointed, Iris Weinshall was the DOT head. You may remember her from the whole Prospect Park bike lane bobble. Her cause became removing one of the most sensible bike lanes in all of Brooklyn. It’s a history thing. The boom didn’t come because Bloomberg’s a visionary, it came because for years critical mass and other groups were saying this is messed up, you should do something about it. From faxes to electronic signatures, just about every new piece of technology has been heralded as the messenger deathblow. Given how many fewer full time couriers there are now than even five or 10 years ago, do you think there’s some truth to it? There’s always kind of the fat on the bone. It doesn’t last long. People used to make a racket on paper fillings. As soon as we had e-filling that vanished. If you were a courier company relying on that for most of your business you were going to be hurting. But if you were diversified, that wasn’t the end of the world. That’s what you see with successful couriers now. They’re exploring niches. Unfortunately, the world everyone is living in is one where we have to work harder doing shittier jobs for less money. But that’s hardly restricted to bike messengers. It’s everybody. But yeah, bike messengers are affected that’s for sure. Do you see yourself continuing to work as a messenger for a lot longer? I’ll tell you right now, I have a really good set up. I work with a small, independent company where we have a lot of latitude and agency and responsibility, which is really gratifying. Also, I can come and go whenever I need to. I’m going to the Middle East for two weeks and I didn’t need to worry about getting the time off. My job will be there. For me personally, it’s good to have that rhythm of that kind of labor. It makes me better value my time when I’m not doing that. It makes me more effective and motivated and happier than if I was just trying to dream up things and fund stuff without this other pressure. I really couldn’t do what I do without my sponsors. Red Bull is a really good company. They’re the largest privately held company, so they don’t have to answer to shareholders. It means they can do really wild and crazy stuff. Their ethics are really good in terms of how they treat their employees. I’m really stoked to be supported by them. In the bike world I’ve been lucky to been aligned with great companies like Brooklyn Machine Works. As a teenager I really wanted one of their bikes. Now I ride with All City who has their heads in the right place as far as making good bikes. Also Oakley and Lazer. There’s a lot of good people are just doing their own thing right now. There are these sort of great microeconomies, where people are making stuff and able to support themselves with it. I’m lucky to work with some of them in the bike world like Outlier, Search and State, Swrve. People are making stuff because they want to and it’s great. This entry was posted in Adventure, Advocacy, Bike Industry, Interviews and tagged austin horse, bike messenger, couriers, cycle courier world championships, cycling in new york city, darien gap, iris weinshall, janette sadik kahn, lucas brunelle, messenger stage race, red bull, times up. Bookmark the permalink.